Flight attendants exiting in grand style down the emergency slide, employees quitting with videos that go viral or via rants on social media…surely you’ve had a day where you dreamt up a creative way to throw in the towel. That’s why we have a little something called, impulse control. While these devil-may-care methods of moving on are certainly gutsy, the glory is sure to fade quickly and the effects can be lasting. Everything inside you may be screaming to let your frustrations loose on the folks who employed you at a salary below your worth, belittled your capabilities and kept you from getting ahead…but don’t do it. Keep in mind that living well is always the best revenge. In this day and age, where google searches on candidates are part of the screening process, you’ll want to leave a clean and positive image behind rather than destruction in your wake. 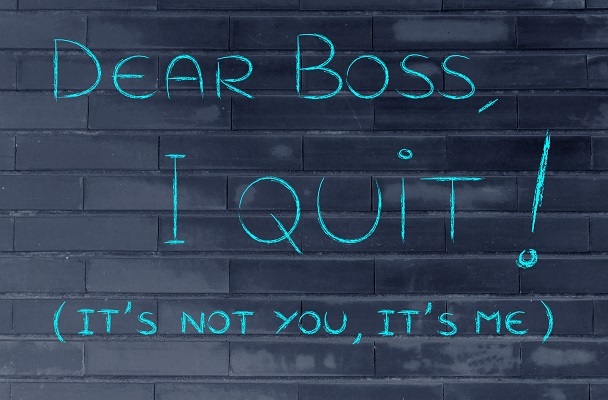 Your resignation letter is a living document that may be referenced in the future. It is not a place to air grievances, list everything you think is wrong with the company or place blame. Even though you may think you’ll never come back, future changes in management might turn this company into a place you’d be open to working again. Besides, your criticism of the organization, at this point, serves no purpose and can only do you harm. Hopefully you’ll have an exit interview where you can offer constructive feedback about your experiences. Let them know that you will make every effort to ensure a smooth transition. Thank them for the opportunity and experience you’ve had while working with them and wish them continued success in the future. Remember, this is a formal notification and it should be brief, to-the-point and cordial. There’s no reason for emotions to be conveyed, especially negative ones. You never know when you might need someone to write you a recommendation!